Regardless, the Beermen should have enough firepower to deal with other teams in the PBA Governors’ Cup. They do have a superb rookie in Christian Standhardinger blending in well with the likes of Alex Cabagnot, Marcio Lassiter and Arwind Santos. They also replaced veteran import Arizona Reid with Kevin Murphy, a reinforcement that is no lemon. But with the rest unable to contribute big numbers, the Beermen find themselves sputtering and may find themselves in a deep hole unless the coaching thrust is able to find a way to get the team back together. With their core nearing the twilight of their careers, it won’t come as a surprise if SMB management decides to pull off some trades moving forward. Back in 2011, the Beermen also had a stellar cast but surprised many when they traded off stars like Danny Seigle, Dorian Pena, and Dondon Hontiveros to Air21 for a crop of rookies in Rabeh Al-Hussaini, Noy Baclao and Rey Guevarra. As most know, that deal turned out to be a lemon with the three top rookies at that time failing to help the SMB cause. All eventually left and the Beermen had to find some other ways to rebuild. And they did. Players like Cabagnot and Santos are seen as players who may have only 2 to 3 years left in their career. It remains to be seen if they will end their PBA stints with SMB or become part of a trade deal that will likely include plenty of criticism. Timing is essential if SMB does have plans to deal off some of its veterans. Dealing them should they be in their late 30s will spur outroar, especially if they are dealt in exchange for younger players. Though it is not something new, it is a reality that can happen. So right now, SMB is not just worrying about their current PBA Governors Cup campaign. There is the future to think off. 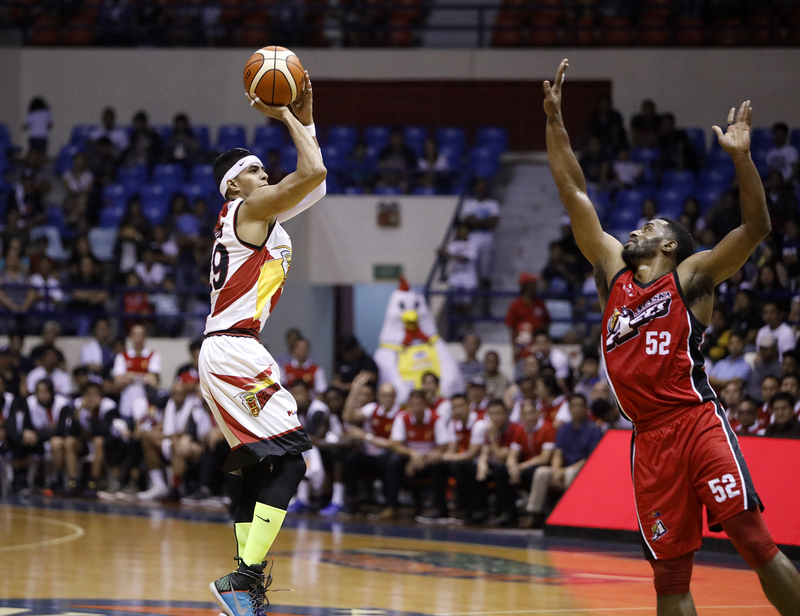 On a potential PBA trade, such is a reality that could happen now or in the coming months – especially if the Beermen cannot find ways to win without the “Kraken”. Posted in Headlines, PBA•Tagged Alex Cabagnot, Arwind Santos, Christian Standhardinger, Dondon Hontiveros, June Mar Fajardo, PBA, PBA Governors Cup, pba trade, San Miguel Beer, San Miguel Beermen•Leave a Comment on PBA: Is it time to revamp the San Miguel Beermen?